BagcraftPapercon is known for the way we serve foodservice operations with innovative flexible packaging that helps maintain food quality, integrity, and presentation while providing convenience and value to customers. BagcraftPapercon provides paper-based flexible packaging with portability in a wide range of sizes and materials. Our products can reduce cost by minimizing inventory while Maximizing efficiency and saving space. 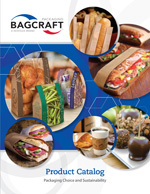 For hot or cold foods including hamburgers, hot dogs, chicken, ribs, pizza and submarine sandwiches to bread varieties and bakery items including cookies, muffins, donuts….BagcraftPapercon continues to invent new ways to package old favorites!